After witnessing Billy Joe an act of cruelty and prejudice that has Billy fearing for his life, he realizes that home is not the place where he and his young son would be safe...no, he needed to run...to run far and fast if he was going to keep himself and his little boy safe. So that's what he does. In the middle of the night Billy Joe packs up their lives, takes his boy and quietly gets the hell out of Dodge or in this case Mississippi. Billy Joe gets as far as Pennsylvania when his luck seems to run out...or in fact his car dies during a snowstorm, but maybe his luck is just beginning when a passer-by stops to offer help...a passer by in the form of Carlos. Carlos shows Billy that there is kindness and good in the world when he goes out of his way to help him without any ulterior motives...just the honest desire of a good and decent person to help someone in need. There was a lot that I liked about this story first off I liked both of the MCs and I really loved them together as friends and as a couple, I loved how their relationship progressed and seriously we're not talking about insta-love here...did their attraction to each other happen fairly quickly...yes, but it was attraction not love and I think we can all think of at least once in our life that we felt attraction to someone as soon as we saw them...whether, or not that attraction deepens and becomes more and how long it takes is what determines whether it's insta-love or just lust at first sight and whats fast or too fast or slow can be such a subjective issue. For me the relationship between Billy Joe and Carlos didn't feel like it was developing at an overly fast pace but I think a lot of that was due to their circumstances. Billy Joe didn't know anyone else and Carlos initially seemed like he was just trying to be a genuinely good person and help them out, which brought these two into close proximity a lot faster and more often than probably would have been the case under other conditions...so given the circumstances for me it worked and while the relationship may not have progressed at a slower pace at times the overall flow of the story was honestly a little slower than I would have liked but in the end I liked it, I guess sometimes it is slow and steady that wins the race or in this case it was the slow and steady that allowed me to truly enjoy the story. I just wasn't able to buy into Tyler his behavior and development was too erratic. Honestly I had initially thought he was a baby and then it seemed like 'oh, I guess he's maybe 4 or 5 years old and then I just kind of threw my arms in the air and said 'what the hell ever, he's Billy Joe's kid and I care not how old he is.' I know his age was clearly defined as 2 going on 3 at one point but I just wasn't feeling it and by this point I no longer cared, so I basically sidelined Tyler and focused on everything else in the story. I cannot lie Tyler is essentially the full reason that this story got 4 stars and not 4.5 or even 5 from me...sorry, Tyler but as a 2 year old...you were fail for me. Ok, let's move on from poor little Tyler because now I'm feeling like a bully and maybe I need to send Tyler a teddy bear to say sorry...I'll ponder this. As for our MCs...there was so much about Carlos that I really liked. How he was basically able to keep such a positive outlook on things in spite of his family and yes, it was very much a case of 'in spite of' and not 'because of', I loved how supportive both he and Billy Joe were of each other which I think was due, at least in part, to the fact that they understood each other in a very basic way...both men had crap families. Sure maybe the circumstances and dynamics weren't identical but at the heart of it both men were failed by their families and they recognized this in each other...reasons and events may be different but at the core it's the same kind of hurt. While it may have taken Billy Joe time to get there...this guy had strength. From taking Tyler and leaving behind everything that he knew to his determined efforts to make sure that Tyler had a better life, to acknowledging who he was and finally doing what he knew was the only thing he could do to ensure his and his son's safety...Billy Joe had strength. If it took him time to get where he was going I can totally deal with that he had to make the hard choices just as Carlos did in dealing with his family and these two both met the challenge. Sure it wasn't without pain, heartache and a few mistakes but who among us can say differently. We may make different choices and our mistakes aren't always the same but at the end of the day we're all human and we all follow our own path. Last but not least I want to talk about the narrator...Jack Richmond. I liked his character voices especially for the MCs they were both distinct making it easy to distinguish who was speaking and while I had an issue with Tyler's character in terms of age development unfortunately Tyler's voice didn't really help with this because for me, Tyler's voice was more reflective of that 4 or 5 year old that I thought he was a one point than that of a two year old, but on the upside it was a child's voice that didn't feel like nails on a chalk board which many of my friends will tell you with me that's a definite win. I loved the ending of this one, especially when it came to Carlos and Billy Joe's families and how things worked out with them and while I'm not sure I'd call this an HEA it's definitely a strong HFN that's heading towards HEA and I'm good with that. 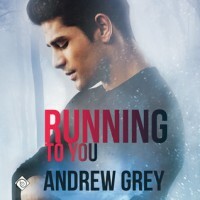 An audio book of 'Running to You' was graciously provided by the publisher in exchange for an honest review.